HaySparkle: Pampering My Skin With Palmer's! Pampering My Skin With Palmer's! Keeping my body nourished is a must for me, I have super dry skin so theres nothing my skin loves more than a huge dose of moisture and these beauties from Palmer's have been doing just that! Palmer's is a brand I've used for years, in fact my Mum even used to slather their lotions and potions on me when I was little and the incredible scent of their products is so nostalgic to me! The Palmer's Coconut Oil Formula is made with fair trade coconut oil and contains no parabens, no mineral oil, no gluten, no dyes, no sulfates and no phthates, theres also the addition of vitamin E so in a nutshell its very kind and good for the skin! All of Palmer's moisturising products claim to moisturise for 24 hours and actually I 100% agree with this, I can seriously feel the moisturiser on my skin the next day but not in a tacky-sticky way, its quite hard to describe but I always apply my moisturisers before bed in the evenings and my skin still feels super soft and nourished the next evening before I apply my next layer! Scent wise..... my oh my it's literally coconut heaven! The scent just reminds me of summer holidays and beach's, it's delicate but some yummy! 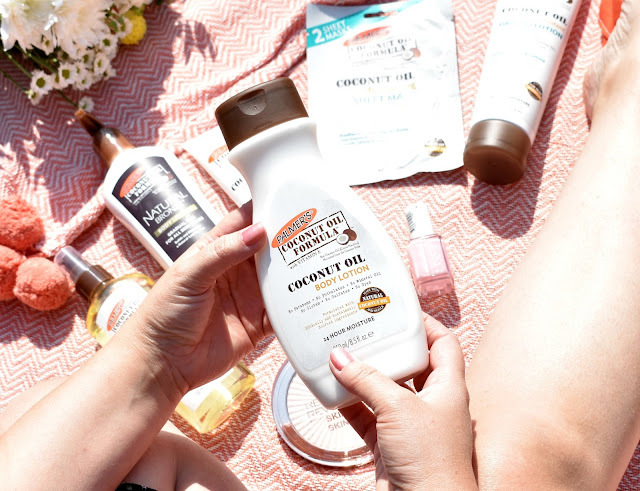 Palmer's Coconut Oil Body Lotion* - If you want a great all rounder body lotion then this is one of the best you can get! The consistency of this lotion is super creamy and rubs into the skin in seconds without feeling tacky and afterwards my skin feels sooo soft! The lotion also smells incredibly good and the scent really lingers on my skin which is just lovely! 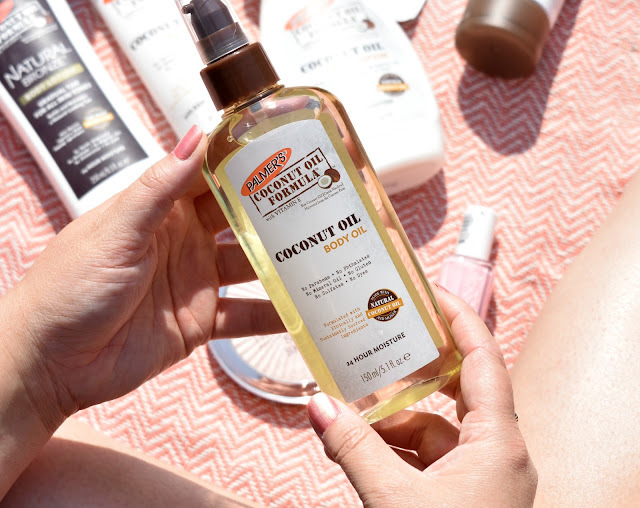 Palmer's Coconut Oil Body Oil* - If your more into body oils to moisturise instead of a lotion then fear not because Palmer's have one in their coconut formula too! I must admit body oils are something I'm slightly scared of, they always make me think I'll look greasy AF but this one by Palmer's may have converted me! 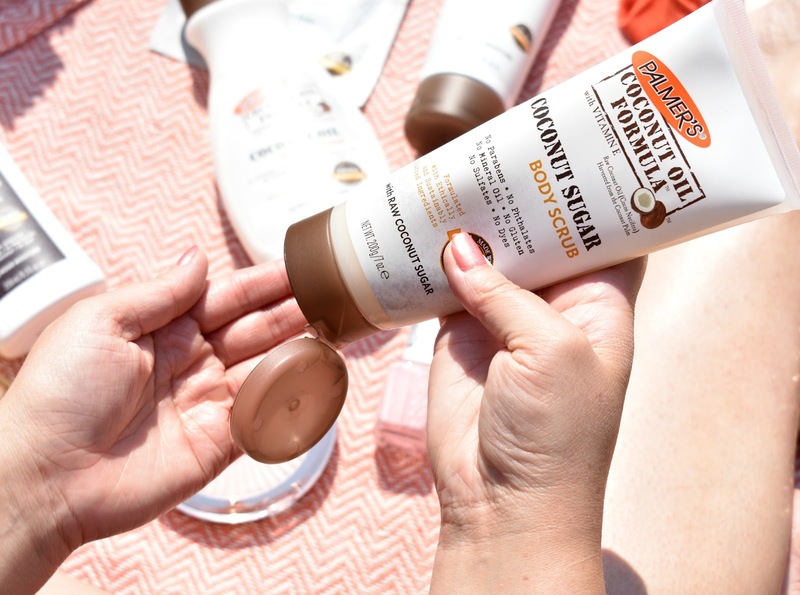 I must admit the oil does feel a little greasy when I first start rubbing it in but afterwards my skin feels heavenly and it actually looks so glowy and radiant, perfect for after holidays when you've got a tan going on! Also if you want to make a highlighting body oil finely crumble up an old highlighter you may no longer use and mix it within the oil, you'll be surprised how amazing it makes your skin look. 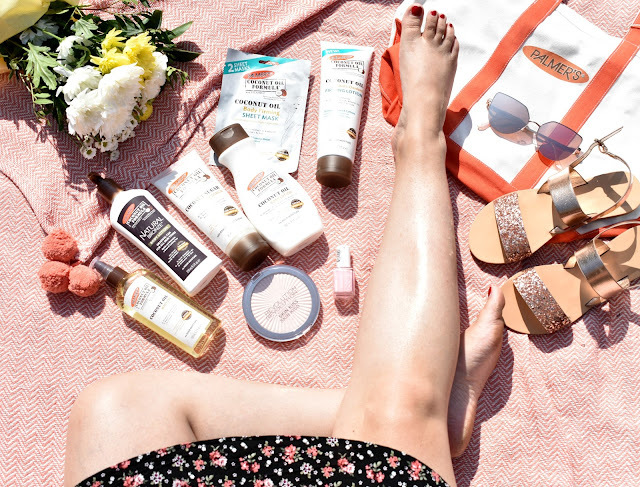 If your after faking a tan for the rest of the summer then the Palmer's Coconut Sugar Body Scrub* and the Natural Bronze Gradual Tan* are the perfect duo. The scrub is formulated with raw coconut sugar which is super fine and preps the skin perfectly without being to harsh or abrasive, this is perfect for me as I'm a sensitive soul! 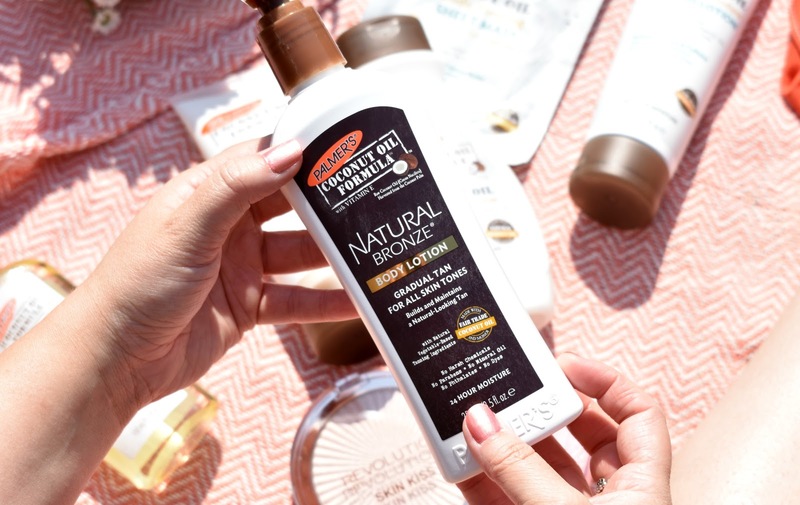 Once my skin is smooth and polished it time to slather on the tan and my preferred choice will always be a gradual tanning product, I'm so scared of properly fake tanning in case I turn orange so a gradual one is just about as much as I can cope with! The Palmer's Natural Bronze Gradual Tan is literally perfect for me, I apply it each evening just like a body lotion and then the next morning I'm looking super tanned and nourished! I actually got amazing results after just one use of this so I apply it every other evening now to keep topped up! 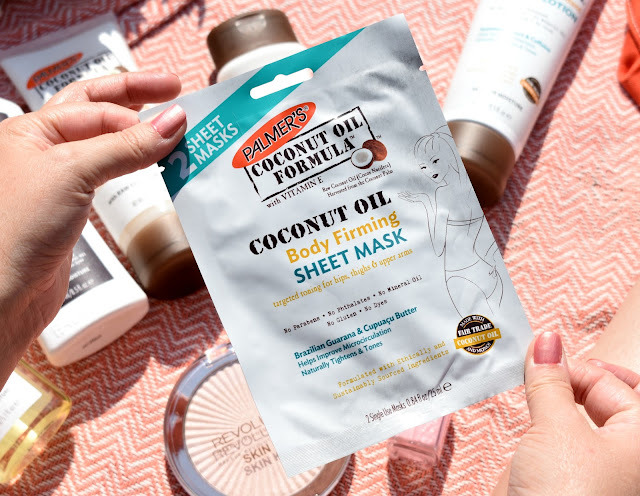 Palmer's Body Firming Sheet Mask* - When I saw that Palmer's had a body mask I was like wait what.... I mean I love a good face mask but a body mask is something else hey! The Palmer's Body Firming Sheet Mask actually comes with two rectangular sheets that are soaked in product which you can place on your hips, thighs, upper arms or anywhere you fancy toning really. When I popped the masks on I did feel a slight cool, tingling sensation which was actually quite satisfying for me, and after 10 minutes my thighs definitely felt and looked smoother and moisturised! I definitely want to buy more to try on other areas of my body now! 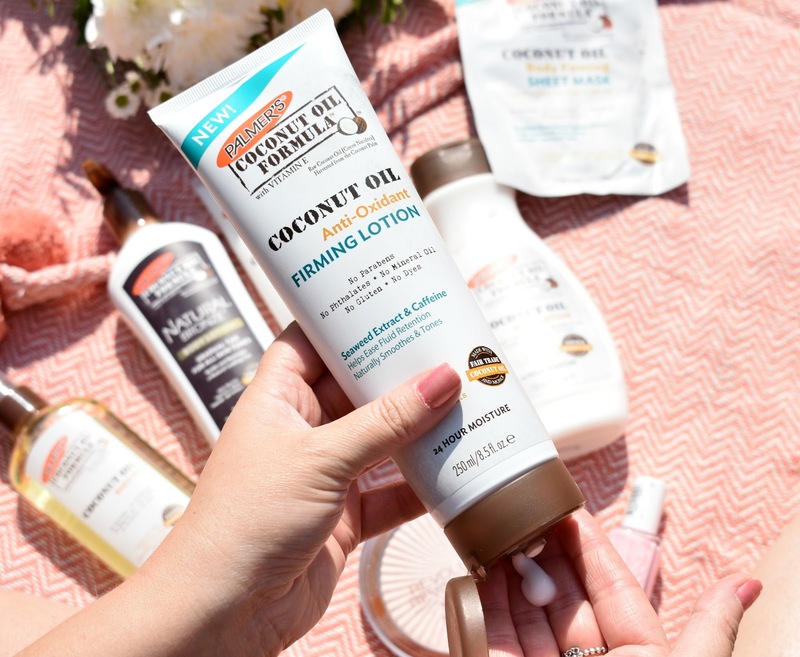 Palmer's Anti- Oxidant Firming Lotion* - Sticking with the firming theme Palmer's actually have a new coconut oil Anti- Oxidant Firming Lotion and I couldn't wait to try this! The formula of this lotion contains marine seaweed extract and caffeine which helps stimulate circulation and ease fluid retention, so in turn it's going to naturally smooth and tone! I've been using this for around two weeks now and I've just started to see a slight difference in my problem areas (my thighs), you definitely don't get instant results here but if your willing to keep up on applications then I bet you will notice that your skin is much smoother and firmer like I have! 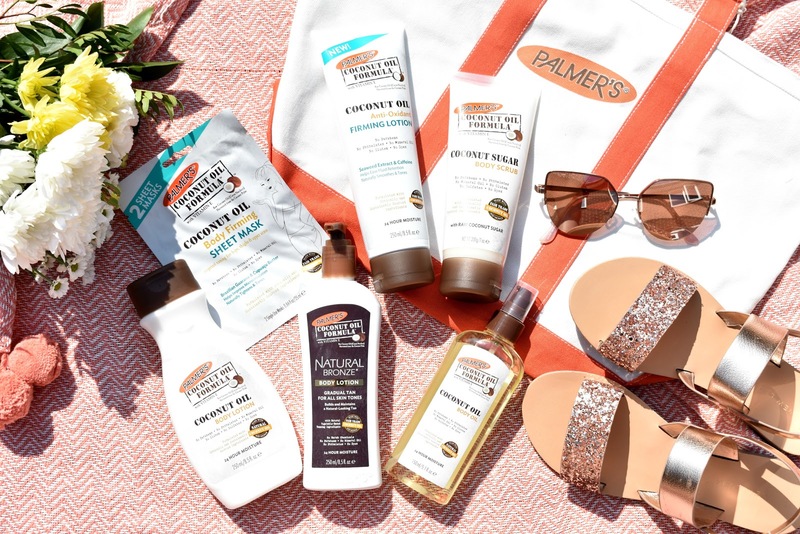 You can find all of the Palmer's products HERE. Should I Go Vegan and Switching Up My Diet!? August Degustabox Review + £5 off Discount Code! False Nails In Seconds With imPRESS! Cafés & Resturants I Want To Visit In London! 5 Amazing Makeup Products Under £5! Summer Nails From Elegant Touch!